Ofwat’s initial assessment of companies’ PR19 business plans has landed. Its verdict? None is ‘exceptional’ and the ‘fast tracks’ are heavily outnumbered by the ‘slow tracks’. PR19 is a big deal for water companies. Not only does the 2019 price review determine their core revenues for the 2020-25 period, it is also considered a major indicator as to how they are performing overall. No surprise, then, that companies were waiting with bated breath as Ofwat published its initial assessment of their business plans on 31 January. Many, though, ended up disappointed. Just three of the water companies – Severn Trent, United Utilities and South West Water – impressed Ofwat enough to be given “fast track” status, meaning their plans have been given the green light. The rest will need to spend the next few months revisiting their plans to make sure they are up to scratch by 1 April. And the few placed in the “significant scrutiny” category – Thames, Southern, Affinity and Hafren Dyfrdwy – will now have to go back to the drawing board and completely rework their submissions. Even then, they will be subject to increased regulatory scrutiny for the remainder of the price review. What should companies take from the regulator’s initial assessment? Well, Ofwat wasn’t lying when it said PR19 was going to be the toughest price review to date. The general feeling in the industry is that their business plans were a marked improvement on the last price review, PR14. However, even those which came out on top didn’t score highly across the board. This is emphasised by the fact that the coveted “exceptional” category remains empty. Slightly puzzling is the fact that the three companies which have been given fast-track status are praised by Ofwat for “setting a new standard for the sector” – similar language to that used in the final methodology, published in December last year, which said exceptional status would be awarded to those that “push the boundaries of the industry and set an example for others”. An industry source suggests the three top-rankers may be on a par, making it impossible to elevate one above the others. One utilities analyst who spoke to Utility Week agrees, saying companies would have needed something “earth-shattering” to be put in the category. Digging into the detail of the nine criteria the regulator used when grading the business plans sheds some light on the companies’ ratings. For some, avoiding “significant scrutiny” will be considered a victory in itself. 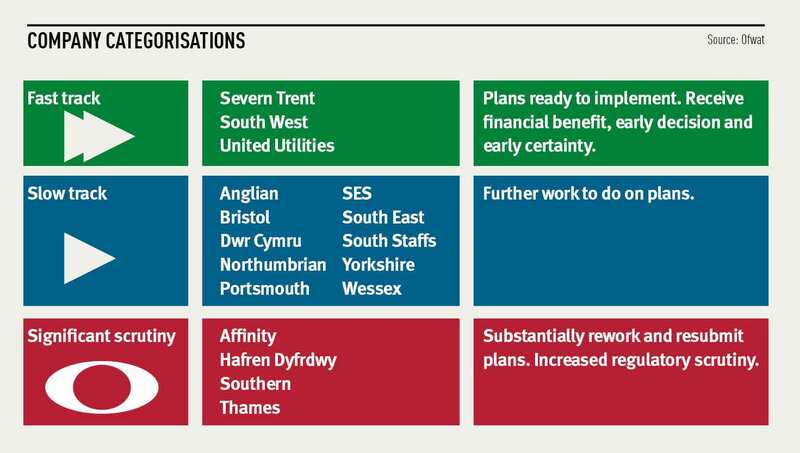 Bristol Water has had a trying time in the past and, despite recent changes at the top, was widely expected to be placed in the bottom category. 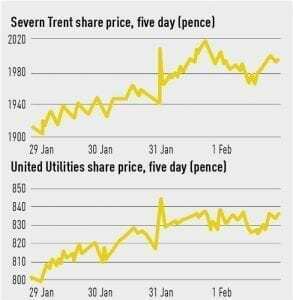 Utility Week’s own PR19 predictions report, published in December 2017, forecast the company would be given a significant scrutiny ranking. Even so, Bristol’s scores leave much to be desired – a C in almost every area, and a D in “accounting for past delivery” – possibly a hangover from past leadership. The decision looks harsh for some companies placed in slow track. 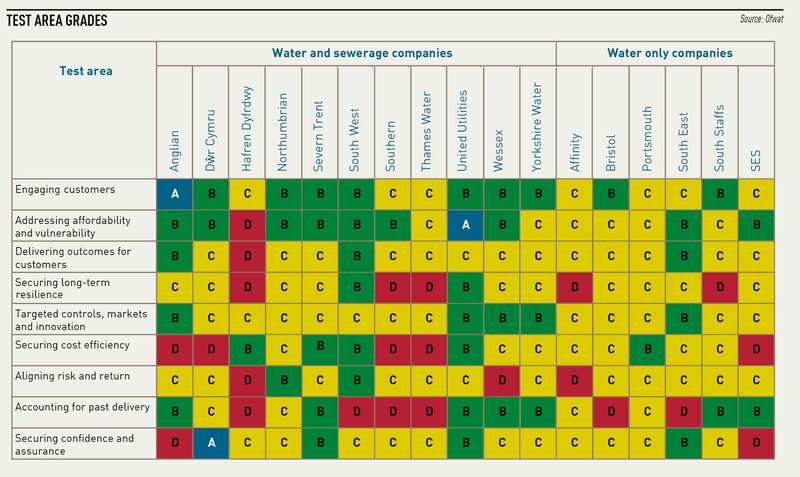 Anglian Water scored highly across the board, bagging one of just three As (for engaging customers), but Ds in “securing cost efficiency” and, puzzlingly, “securing confidence and assurance” dragged its overall score down. Meanwhile a set of decidedly average scores put Northumbrian, which had been pegged for fast track, at least, among the slow trackers. Affinity Water will be particularly disappointed with its significant scrutiny assessment. It was one of only two companies to be fast-tracked through the previous price review process, PR14. To have fallen so far will have left it reeling. The company declined to comment. For the companies in the “relegation zone” of significant scrutiny, big challenges lie in wait. Environment secretary Michael Gove has accused them of a lack of ambition, not least as they operate in the most water-stressed regions. “I fully expect the revised plans to be more ambitious in delivering for customers and the environment, and I continue to offer Ofwat my full support in holding companies to account,” he says. Some in the industry have expressed concern that so many companies have been placed in the slow track, especially because the connotations of “slow” may send a bad signal at a time when questions hang over the legitimacy of the sector, and renationalisation is a very real threat. Interestingly, the three highest-rated companies are all listed on the stock market. The share prices of all three shot up on the morning of the initial assessment announcement. One industry player suggests that this, along with some of the language used in the document about financial models, is evidence that Ofwat favours this type of corporate structure. It is no secret that the regulator is concerned with the level of debt in the sector. 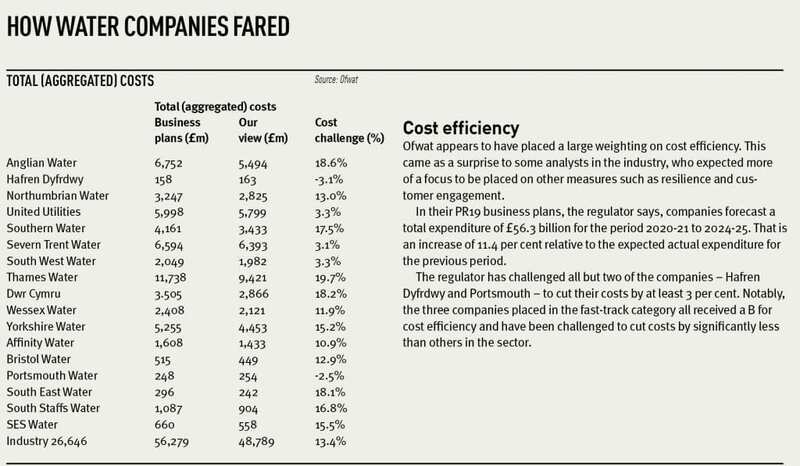 Gearing shows how much debt a company has as a proportion of its regulatory capital base, and one utilities analyst suggests that Ofwat may be “getting its own back” on companies that geared up in previous price reviews. For the fast-track companies, Ofwat will publish its draft determinations on 11 April. Those put in slow track and significant scrutiny have until 1 April to revise and re-submit their plans; Ofwat will publish its draft determinations for them in July. Final determinations will come in December. Ofwat has shown it is not afraid to be tough on the sector. As companies look again at their plans, will need to up their game.